Is there any provision for this in the KC46, perhaps through the E&E compartment? The crew ascends through a hatch underneath the jet's nose and is flying in 10 minutes. No stairs needed. So the answer is yes, but I couldn't find a more detailed reference. He can be reached via Twitter @jonostrower if you want to ask him for more info. this is to start the APU ? The KC-46 would have a similar nose configuration. I suspect the KC-46 cut-way would not be available, until they are fully operational. The contract was for 18 KC-46A and 9 pods in October so the question is will the USAF waive penalties for the extended delivery timeframe. If they have not waived any other penalties why start now, however, I agree with Kanban, Boeing should accelerate delivery, if the Air Force cannot accept then a serious discussion can be had about lowering the penalties. Boeing has rightly eaten cost overruns, they have a number of frames in various conditions around the field, now that they have a firm date in relation to frames already built and some tested (versus design) they should crack some whips and get them out ASAP, let the Air Force park them at an Airbase until they have sufficient trained crews to operate the a/c. It's a moot point on whether or not the USAF could accept them that fast. Boeing quite frankly would not be able to deliver them that fast even if they did get all their ducks in a row. There should be least 35+ completed frames hanging around already. Including the development frames and at least one LRIP 3 frame. I imagine they (non flying flames) will soon be going for paint and engine fit. If it were only as simple as painting and installing the engines. With all the wiring changes the program has gone through I would venture to say that quite a few of those frames still need them to be incorporated. Which is manpower and time intensive. And at least 7 are already flying. I imagine at least some of the frames sitting around have been updated with fixes/improvements along the way. I suppose we'll just have to wait and see how productive the next 4 months are. KC-46A, number 9 of the LRIP batch #3 (total 15 aircraft) is already in the Everett Modification Center. They better start delivering soon. Otherwise the ground underneath Everett will start sinking. Maybe they can deliver an entire squadron at a time. Maybe they can deliver and entire squadron at a time. Should have used the as I was being facetious. I am aware they will be delivered individually even though this will mean Boeing misses the original contract for number of required frames and could incur additional penalties. Anway it's all on Boeing if they can't make October commitment. What is the status of Batch #4 (FY2018) ? With the present 2 aircraft /month assembly rate in two months time the first aircraft of Batch #4 (L/N1160) will roll-out the FAL. I hadn't been following this real closely. I didn't realize that part of the testing was being refueled by a KC-135. "KC-46 tanker aircraft completes flight tests ahead of first delivery"
"The KC-46 Pegasus has successfully completed its final flight tests, setting the stage for delivery of the first aircraft to the U.S. Air Force in late October. The joint Boeing and Air Force team tested the Remote Vision System and completed tanker aircraft refueling certifications for the F-16 Fighting Falcon and C-17 Globemaster III, the Air Force announced Friday. The testing also included the KC-46 being refueled by the current KC-135 Stratotanker, which fulfills minimum qualifications for delivery of the aircraft." Where will the first batch of Pegasus tankers be based? Tinker AFB perhaps? Four KC-46 Tankers will be delivered to both Altus Air Force Base and McConnell Air Force Base in October. The Air Force broke ground on a 158-acre Tanker Sustainment Campus on Tinker Air Force Base in Oklahoma in 2016. The campus is expected to house 1,300 employees. So it seems many different groups of politicians will get to say they've brought home the bacon. The Wiring changes will not be that big of a deal as they are not complete wiring changes, only modifications Since the plane is FAA certified? All the wiring changed was to effect Mission readiness. The operational wiring that made it a B767? More than likely won't be changed nor replaced. The Refueling or tactical wiring? is more than likely covered by an STC (Suplemental type certificate) which they might need if they intend to use parts made for other B767's like the new ones FEDEX is getting. And others in existence which might include Engines as United flies the PW4000 as well. 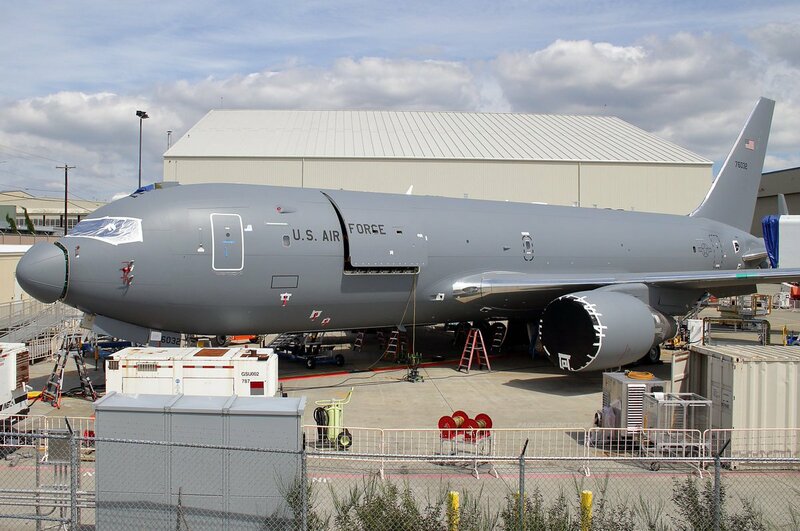 Boeing took a USD 426 million write-down for this quarter related to higher estimated expenses for retrofitting eight of the three-dozen-odd KC-46 tankers in various stages of production ahead of final certification. So this brings the total program charges to some USD 3.5 billion. And still reported a healthy quarter. Hopefully most of the development teething pains are behind us and we'll start seeing this needed capability delivered to the US Air Force in numbers. Oh well. The USAF could have had KC-45s in the air already. Politics got in the way. Boeing's defense sector would have suffered though, as there is not much left in the pipeline at the moment. Writing off $3.5B before the first product is delivered sounds like suffering to me. Boeing also might have been better off if KC-45 was selected. And they could have had KC-767s in the air for over a decade. Politics got in the way. True, but the KC-45 beat it. Hence the updates of the KC-46. True, but the KC-45 beat it. Because Airbus, NG and the USAF colluded to cheat to win, which is why the GAO (which is non-partisan) threw the award out and forced a (third) re-bid. And Airbus could have won that one, too, if they were willing to charge less than Boeing. But they were not, so they lost. How's that "charging less" strategy working out for Boeing? You have to look at it in the long view . . .
Actually charging less or more would not have made much of a difference on how much Boeing will lose initially. As with all government contract, I believe that you can not undercut or quote the government prices that are less than what you believe you can make it. There may be laws on this. So Boeing would have to bid the minimum on what they thought they could build the plane and is willing to eat the risk if any issue come up. And they came up . . . and how. I suspect NG (the prime contractor for the KC-45) probably did the same but since their frame cost more in the first place, they were at a disadvantage. It would be up to debate on whether NG would not run into their own problem and would have to pay the penalties (who knows?). Boeing has a healthy commercial line to offset their tanker snafu, would NG had the same? Would Airbus help out? All speculations. Anyway, from Boeing's stand point, the KC-46 contract did contribute to the stability of the 767 line which also resulted in a few commercial 767 freighter sales. And if the Air Force never get the next KC-Y going and stay strictly with the KC-46 fleet, then I'd say it would have been the correct move for Boeing. Quite right. And I'm amazed that the KC-45 fans still can't get over it. It LOST, end of story. And I'm guessing that when/if KC-Y RFP ever materializes, the KC-46A will be in an excellent position to extend sales past the initial 179 aircraft for the USAF. Implied is an Israeli purchase of a 767-based refueling tanker. If they decide on new build, clearly Boeing would offer the KC-46A. [How's that "charging less" strategy working out for Boeing? Clearly not very well. But that is just one more reason why the claims by the "Butthurt Brigade" that the KC-45 decision was overturned purely on political grounds to ensure a Boeing win doesn't hold water. If the goal was to have Boeing win, the RFP would have been written to explicitly define airframe dimensions and operating weights that only the 767 could meet or they just would have done what the Armee de l’Air did with the A330MRTT purchase and not even bother to invite any other OEM to submit a bid. And then they would not have done a Fixed Price contract so the USAF would have eaten all these overruns and not Boeing. ....same foolishness, letting truth and accuracy get in the way of a good Boeing bash. Besides, everyone knows that the US Government subsidizes Boeing via its military contracts, so are we sure the 3.5 bill is not fake news? well? they still got the better airplane! there's no way in HELL Airbus could have responded to the changes the Air Force demanded. And? I seriously doubt they had the expertise to incorporate all the changes from the B767 to the KC-46 because there are a "TON" of them. Thats debatable since they don't "got" nothing. It's not in service yet due to those "changes". The A330's boom is arguably better than the 767's. The KC-45 met most of the requirements. One of the bigger requirements IIRC, was some or other cargo door that the KC-135's has, that the USAF wanted on the KC-X. Boeing offered to add that to the KC-46. Boeing cried fowl about the KC-45. The second round got tailored for Boeing, so Airbus didn't bother participating. So they'll get the "better", since its tailored to their specifications. But it's coming at cost. Of course they had the expertise to update the A330. Airbus and NG do this everyday... it's their business. I'm sure the KC-46 will mature nicely over time and be a great asset though. It will certainly cut costs over KC-135, which is always good. And the same frame will likely be used for other replacements too. Airbus very much did bother to participate in the final RFP. It was Northrup-Grumman that pulled out, so Airbus submitted the KC-45 on their own. And as the KC-45 met all the requirements (as did the KC-46), all Airbus had to do to win was offer a lower price than Boeing because the contract rules awarded the contract to the lowest bid in such a scenario. A strange decision I think, the only possible rationale I can come up with was it saved some weight allowing a higher fuel load? Other question, can Boeing ever make money on this program with all the massive overruns they’ve had to absorb ? Boeing's rationale would be that they could meet the requirements without it and deleting it saved money. The real question is why didn't USAF have some requirement that would have needed them. Because they don't need them where they'll be operating from? As pointed out none of the KC-135s have thrust reversers and the runways they'll be operating from should be plenty long enough even in cases of contaminated runways. They probably felt the risk of overun too much to offer a low bid. Again, as I stated earlier, you can only low bid what you believe is the minimum of what it takes to do the mod. Considering that if you assume that the man hours it takes to develop the KC-45 and KC-46 would be comparable considering they are accomplishing the same thing, and the man hours to mod the each of the air frames would be the same - just for argument sake, and the Air Force knows your rate and capabilities, then the only difference between the two bid would be the up front cost of the airframe (A330 would be higher) and any infrastructure mod you need to support the new frame (A330 would be higher). The last item would be the risk of cost overun. NG do not have a robust commercial division to absorb any overun. So it was probably a good strategic reason for them not to participate in the final bid. All this talk of underbidding can only be taken to a point. Any bid would have to be evaluated on whether the statement of work is reasonable. Boeing KC-46 problems lies primarily in the wiring (a management snafu caused by decision to use BCA wiring engineers as opposed to BDS wiring engineers) and the boom (caused by Engineering decision to go with a simpler boom system). Both of these item could not have been foretold int he statement of work. The thrust reversers were specifically removed in favor of a fixed duct at the last minute under great secrecy. It was the ace in the hole against Airbus' proposal. So Airbus refused to remove their thrust reversers to save weight on the heavier frame because.....to be a fair RFP both sides had to know that removal was an option. I would have thought Airbus would jump on that since they never thought to propose folding wing tips to reduce the greater wing length of the A330, however, this is just a side thought to the main issue here, the continued delayed delivery. I doubt the RFT listed a requirement for or against thrust reversers so it would not have advantaged or disadvantaged either vendor. All Boeing did was remove them to save weight, reduce mechanical complexity and subsequently increase fuel load and lower sustainment costs. There are probably a host of additional work that both vendors could have undertaken that would have accomplished similar gains but that would have come at the cost, and risk, of increased variations from the baseline aircraft and the costs associated with modifying them. How much more fuel load did this decision allow? How many KC-135s have been unable to stop while landing? Thrust reversers are a nice to have. Especially when operating out of the long runways that the KC-46 will be. How many airbases were in operation when the KC-135 was put in operation versus today? USA and the world has been having closures. How many airbases are available to the USA today versus when the KC-135 was put in operation. Politics is not static. Why spend millions and take delays ensuring that the a/c is fully FAA certified when in an emergency it will struggle to use the nearest civilian strip or at best will need to have special approach procedures around the civilian airport? At present no tanker offloads its entire inventory on a regular basis, so is the additional fuel allowed just a number to look good on paper but has no real significance? From my previous life . . .
Aircraft are certified to stop the aircraft at max load rejected take off with brakes at the most worn condition (no reversers). Thrust reversers are for the most part used to reduce the wear and tear on the brakes. Airlines like them because of the cost of replacing the brakes. Pilots likes them because they stop the plane sooner so they can get off the runway faster. Note that all aircrafts are certified to fly with T/R deactivated. If one T/R acts up, they deactivate both and fly until they have a chance to replace the troubled components. For the KC-46, the number of flights per day is greatly reduced compared to a typical airline. So with the newer generation of brakes with slower wear, it may be possible for the USAF avoid having to touch the brakes for a long time. The primary maintenance item for the Thrust Reversers are the 6 hydraulic actuators per engines (for the 767). If you can get rid of that system, it would save you on maintenance, weight, and a lot of cost relating all the clap trap you have to build for the blocker doors and translating sleeve.